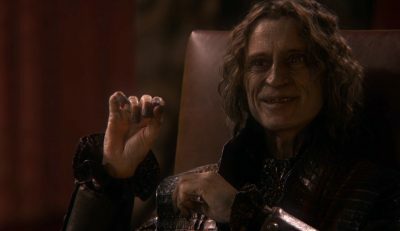 Well here we are again, the first piece of new content for the archive site and it’s going to be a look at Once Upon A Time and more specifically a Robert Carlyle episode from the first season entitled “Skin Deep”. In this episode Rumplestiltskin meets Belle for the first time after agreeing to end her fathers war with the trolls. Meanwhile in Storybrooke Mr Gold is imposing his own business ethics on Moe (Belle’s father) after he failed to repay a loan. David and Mary Margaret continue to their dance unaware of who they once were and Emma now the sheriff investigates a robbery of Gold’s home, a very important item has been stolen. Skin Deep is a very rewarding look into this show’s version of Beauty and the Beast, there are some wonderful moments between Rumplestiltskin and Belle never more so after the Queen’s interference which leads to some home truths being dished out to the dark one. Our thanks to No Spoilers Dearie on twitter who helped us to decide what we were going to do for a first piece of new content for this site and while it’s not a full Once Upon A Time podcast we hope this is acceptable. Welcome to the roundtable discussion of the two seasons of Stargate Universe in this wrap up show. Joining Mike and Alan are Thomas, Ian and Steve along with additional material from the co-founder of the podcast, Scott. On the show we discuss Stargate Universe in general and answer a few more specific questions in we hope an entertaining fashion. 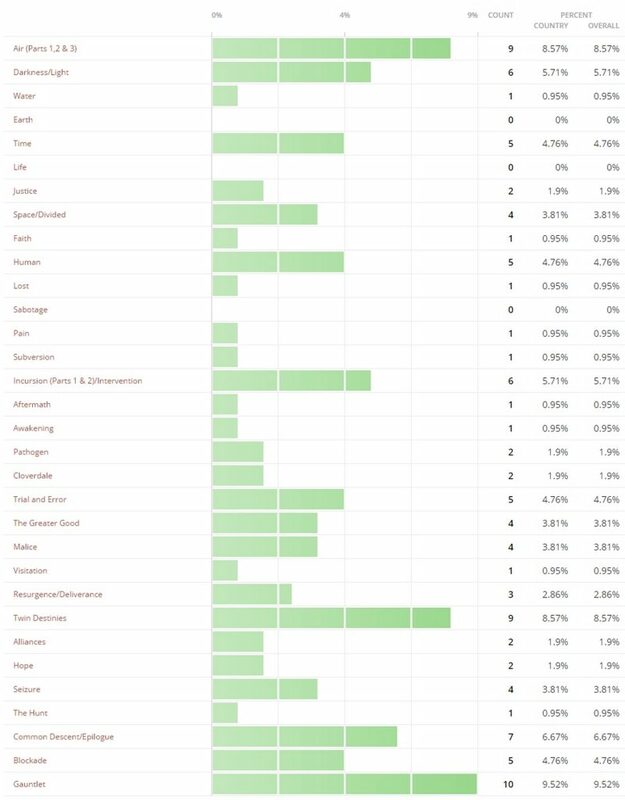 We also have the results of the favourite episode listener poll which we ran for a week and while we didn’t get the number of votes when compared to our other polls (which ran for around a month) we got enough to give us an idea of how the show fared. We would like to thank everyone that has contributed to the Gatecast podcast for these past few years but there have been so many so for now we want to have a special mention for the three guys who joined us over skype to wrap our coverage of Stargate Universe and also to Brad for the feedback over the years and dedication in getting up so early so often to talk with us, alas scheduling prevented him from joining in directly. We also want to thank Holly for the feedback over on our Facebook group and to Dan for the email along with our continued thanks to every follower on our social media, you’ve all made this journey worthwhile. In particular those that have joined us on the show to talk Stargate are going to get named (but not shamed) and while I am pretty sure this is a complete list if I have forgotten anyone make sure I know so I can correct any mistake, I would hate to have missed a guest while scanning through 350 episodes. Well this is Gauntlet the season and alas the series finale of Stargate Universe and while the episode was not specifically written as a series finale it actually works very well and by some miracle doesn’t annoy the viewer with a slap in the face cliffhanger. Of course as we know the final scenes of the series leaves everyone hanging by a thread but it’s done with such style and care you really do not mind, at least not too much. The Drones once again are pressuring Destiny and continue to block every single useful star in the immediate flight path of the ship, it’s simply impractical for Destiny to seek out resource rich worlds off the path as laid down by the seed ships so the question is asked what can they do. Eli comes up with another solution, not a good one but it has the benefit of not only preventing further conflict with the drones but maximising the current resources of the ship. His solution is to make use of the recently activates stasis pods, those combined with an energy saving FTL cruise would allow the Destiny to leave this current galaxy and bypass the are of space controlled by the drones. The margin of error is very small and the decision to implement this option would have to be taken very quickly, if Destiny’s power reserves dropped too low while in FTL the ship would be stranded in the intergalactic void with hundreds of years of sublight flight ahead of it. Some of the crew are give the option of a last visit to Earth but a minor hiccup almost derails the endeavour as some of the pods are damaged and a certain mineral is needed to enact a repair. Activating the gate will of course draw a drone command ship to their location but they lay down a diversion with one of the shuttles broadcasting a powerful signal to fool the drones, when they take the bait the shuttle does a kamikaze run and destroys the command ship and Destiny gates to the planet and collects the required material. The pods now working soon fill up and eventually only Eli, Rush and Young are left, it is then they discover one of the final three working pods is still faulty. 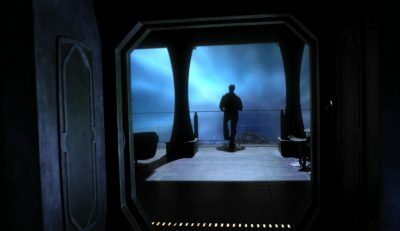 Young doesn’t trust Rush to not risk the ship if he was unable to fix the pod after he and Eli went into stasis so Young decides to sacrifice himself but Eli makes his stand, he is confident he can fix the pod in the time allowed and will not hesitate to put the ship and crew ahead of himself if he fails in his task. Young and Rush bid their farewells in a manner which truly reflect how they feel about this young man who came onboard as a bit of a bad joke but through adversary has matured into a man that could one day lead others. Gauntlet was an impressive episode, there is as much action as you would expect from a modern scifi series and far more drama and character work than most, par for the course with Universe but this being the finale really brings it all home. It was quite an achievement to pack so much into this last “hour” of television without sacrificing so many quiet dialogue driven scenes between characters many of which showed how far these people had come. The final situation/obstacle that Eli, Rush and Young had to deal with also summed up the show to perfection, distrust, compromise and acceptance all brought together and allowing one of the youngest members of the crew and one never intended to be part of Icarus to commit himself and his life on his skill and a simple choice to protect his friends even if it meant his life. 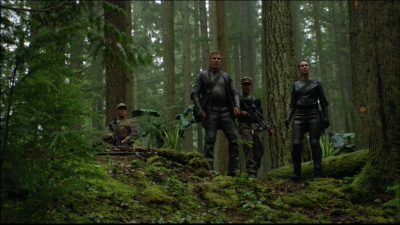 I’m already looking forward to watching Universe again in the near future, I really am surprised how much I have enjoyed the series after it had kinda been moved into the “will watch again one day” category whereas SG1 and Atlantis were always ready to go whenever I felt like it. The production levels, CGI and writing were all top notch and even now a few years down the line there is nothing that surpasses the quality of this series, equals yes in the case of say The Expanse but does not eclipse. 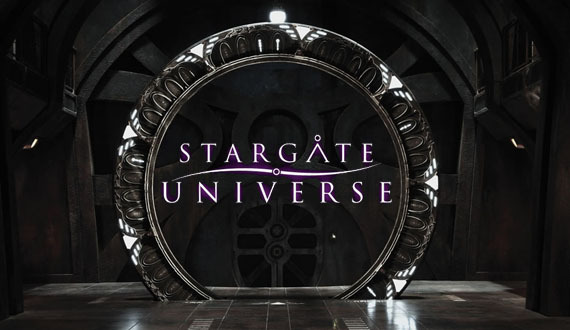 Our thanks to Thomas for joining us for Gauntlet and next week we are going to have a roundtable discussion on Stargate Universe as a whole along with the results of the quick favourite episode poll we ran for a few days. This weeks promo is for Nutty Bites and even at this late a stage if you send something in before the 21st I can get into the wrap up show as feedback. Miles joins us for Epilogue the second part of the two parter which expands upon the bread crumbs offered up from Twin Destinies. The Destiny has for now broke contact with the drones and has travelled to Novus in the hope of discovering why the settlement lost contact. Initial survey clearly shows a world in the middle of a “nuclear winter” as ash falls gently and global temperatures too low. Yaozu leads the group to the entrance to a huge bunker and they use the main gun to tear open the doors, venturing inside they find the complex has power and thirty levels down they access the planets database complete with all kino footage dating back to the founding of Novus. The lives of well themselves play out and much is revealed of the first few years on Novus as people die, couples have children, the beginnings of the split in ideology and a society which is visually growing and developing. They also learn that a black hole is indeed responsible for the growing instability of the planet as the core gets more and more active and volcanic fissures continue to expand including one directly under this city. Near the end though the two nations on this world stepped back from the edge and as in the beginning joined forces and built a number of generation ships to allow much of the population to escape, they are sublight and aimed for the various settlements but the people of Novus and humanity has not died out in this galaxy. Time is critical and they begin to upload the huge database to Destiny, Rush discovers a solution to the ship’s air filtration systems and as the complex begins to collapse the fight for survival leading to Varro being critically injured whilst saving TJ. Epilogue is a stunning episode and totally exploits the groundwork provided by Twin Destinies and Common Descent. The revelations of a life not led were moving and at times emotional from the loss of Dale through to the birth of his namesake, the many other births and of course the path that TJ will have to travel. Oh yes who could also forget Brody and those damn kids. As the season draws to a close we know there was never going to be any follow up given that the people from Novus were bound to this galaxy as Destiny travelled on but perhaps we would have found one or two characters were reintroduced if indeed we had gotten a third season. Our continued thanks to Miles for guesting on the podcast, it was a good evening discussing two of the best episodes of Stargate Universe. Alan will be back next week along with Ian for our discussion on Blockade and as with Destiny our journey is coming to a close. Thanks to everyone that voted in the SGU favourite episode poll, results will be in the wrap up show we recorded a few days ago. The crew of the Destiny come across a group of humans descended from well the crew of the Destiny in the episode Common Descent. The air scrubbers that were retrofitted when the Icarus group first boarded the ship are failing and the search begins for more lime or similar material to help clean the air. They gate to a planet and meet two English speaking young people who recognise both Scott and Greer and reveal that they are the latest generation from the crew of Destiny who found themselves stranded 2000 years in the past after attempting the nice chevron dialing within the star as told in Twin Destinies. The news of these spreads quickly with Eli, Chloe and Camille venturing to the planet where they greet one of the settlements elders named “Yaozu” who recites a verse very familiar to Camille and in its native language. The crew then learn about the lives of those who fled the Destiny never to return thanks to the extensive use of Kinos and the ability to maintain the integrity of the day to day records of their society. No doubt Eli with his long held belief that everything should be documented would aid this young society in the centuries to come allowing for more rapid development and no corruption of historical figures and events. This settlement has lost contact with their homeworld “Novus” which was experiencing geologic issues which they were beginning to believe were being caused by a small black hole passing by the solar system, with no gate access to resources the settlement is dying but Young refuses to take them back to Novus as Destiny itself even with limited repairs would be unable to handle the extra personnel, the the drones attack. The Destiny is battling the drones and taking people off the planet as it too comes under fire but when the Stargate is damaged the Destiny jumps into hyperspace and abandons a number of her own crew along with the last of the Novus citizens. Eli manages to get a message to the Destiny using the gate control subsystems and the Destiny swings back and transports the people to Novus. Unfortunately the planet is wrapped in extensive cloud cover with low temperatures and particulates in the atmosphere. The cities are intact though but no life is found and it is believed a major volcanic eruption drove the planet into nuclear winter and decimated the population of Novus. Common Descent is a very entertaining episode which really makes the most of Twin Destinies at a time when there was no indication those eighty or so people who were lost in a wormhole would ever be heard of again. The producers and writers however have created a master stroke in exploiting a time travel narrative in a less than usual way with very positive results and far more to come in the second part of this story Epilogue. Our thanks to Miles for joining us this week, he’ll return for Epilogue and continued thanks to Brad for the feedback for The Hunt. This weeks promo is for Flash Pulp and next week we are as mentioned going to be watching Epilogue, we hope you can join us for that. In this weeks episode The Hunt a small opportunity to visit a welcoming world full of resources and wildlife, a deer like animal is sighted and Greer has a hankering for a good old fashioned BBQ but is unable to pull the trigger, it seems his recent emotional roller coaster has taken it’s toll on the hell for leather soldier. Something seems to spook the “deer” and then Scott is attacked and again Greer fails to fire which allows the “beast” to rampage through the nearby camp causing some injuries. TJ and Cpl Reynolds are missing and they are believed to have been taken by this huge predator, they have little look tracking the beast until Varro and the remaining Lucian Alliance soldiers offer their services being more familiar with the more day to day requirements of living off the land. The tracking party are however led into a trap clearly indicating this “beast” has intelligence and with more injuries Varro and Greer go on alone eventually locating TJ and using explosives distract the alien pack reach the cave. They find TJ and Reynolds along with this intelligent creature and Greer lowers his weapon in the belief that the animal recognises the threat and the removal of said threat, the animal backs off and lets them all leave. Meanwhile Brody has been locked in a stasis pod they recently found, Eli thinks he screwed up but it was actually Rush who was proving a point when it comes to jumping feet first into alien technology, a day later Brody is released in time for the Space Deer BBQ hosted by Becker with help from Varro who is now even closer to TJ than before. The Hunt is pretty much as standalone episode no doubt written and prepared long before they knew of the shows cancellation so while it may seen like a wasted opportunity it’s understandable why the show was willing to tell this sort of story. The cutting of some TJ backstory doesn’t help but we do get some good character development between Varro and TJ and it’s a shame he ends up being the only Lucian soldier left on the ship, I would have liked to have seen more of Tasia played by Kyra Zagorsky who also appeared in the Atlantis episode Reunion. The CGI and location shooting were top notch as you would expect with this production and the issues Greer was dealing with give a lot more weight to his character. The “b” plot as it were dealing with the reveal of the stasis pods and Brody getting trapped in one provided the levity the episode needed and if for nothing else watching Rush smile as his made the younger scientists dance to his tune was a delight. Our thanks to Ian for taking the time to join us over skype to talk Stargate and he’ll be back for the episode Blockade. This weeks podcast promo is for The SciFi Diner and next week we are joined by Miles one of the hosts of that show for the episode Common Descent, we hope you can join us too. The crew of the Destiny have to deal with a holidaying Rush in the episode Seizure as well as fall out from events on the planet Langara. Homeworld command are in negotiations with Langara to use their world as a staging post for dialing Destiny thanks to the veins of Naquadria that run through the planet. Naturally given two worlds have already been destroyed the Langarans are not overly enthusiastic and are also under pressure from the Lucian Alliance. The military led by Telford favour direct action as they believe the Langarans are already dealing with the Alliance and so a plan is formulated by Dr McKay and put into action. On board Destiny Rush is having a day off and is using the chair to send his consciousness into the ship’s computer where his and Amanda’s bits and bytes can overwrite each other with abandon. When it’s time to leave Rush finds himself trapped in the computer with no control over the programme currently running and Ginn is desperate to get critical information to Eli before the system breaks down with catastrophic results. Seizure is an entertaining episode with a fantastic guest star including Victor Garber, Robert Picardo and of course David Hewlett. It’s a pity Jack only gets a mention but the screen is certainly full of quality acting and some excellent location work in a former power plant (now a museum) which would be familiar to many a Canadian sourced tv series shown over the last decade. It was interesting to see how confrontational Homeworld was based on the belief the Langarans were double dealing and that based on very suspect intelligence gleaned from encrypted communications. In many ways it’s not a side of the SGC we want and leans more towards the dark days of the NID or maybe just the desperation by one or two individuals pushing an agenda regardless of the consequences. Helen Shaver did a magnificent job directing her first Stargate episode especially given the complexity imposed by characters who had backgrounds on SG1 and Atlantis. They say when all else is gone there is always hope and for Eli and Rush that hope appears in the aftermath of the attack on Homeworld Command and the loss of communication via the stones. It’s been weeks and no contact but the station is continual manned just in case and then as Chloe rests her body is inhabited by an intelligence which reveals itself to be Ginn. This causes some consternation since well Ginn and her consciousness is long gone after being murdered by Simeon when she was visiting Earth to help prevent the Lucian Alliance attack. Ginn is very confused, the last thing she can clearly recall is talking to the officers at Homeworld Command and it comes as a shock to learn that she is technically dead, her body having being buried by Eli on a world light years away. 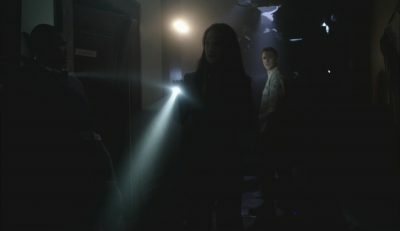 Rush reveals that he had talked to Franklin which opens up the possibility that whatever is Ginn at this time could be transferred into the Destiny’s computer and retain sentience and time is running short, continued physical choking is risking Chloe’s body and just to complicate matters Amanda Perry makes an appearance. If all this wasn’t enough Volker is in critical condition suffering from kidney failure, despite the risks Greer is a match and is will to donate a kidney and while TJ is emotionally distressed with the situation (being a medic after all not a surgeon let alone a Doctor the operation goes ahead. Surprisingly it’s the Volker storyline that ramps up the comedic aspects of the episode and it’s not even dark humour at that. Ultimately a solution is found thanks to the skills of Eli and Rush, Chloe is herself again and the Amanda AI assists TJ in the operation resulting in a successful conclusion for the two men. Hope is another excellent episode of Universe, lots of drama and comedy with some great performances thanks in no part to a good script. We see that the arboretum is now fully repaired offering an “oasis” within the ship full of life and Greer and Volker taking a rest stop there was a moving scene. 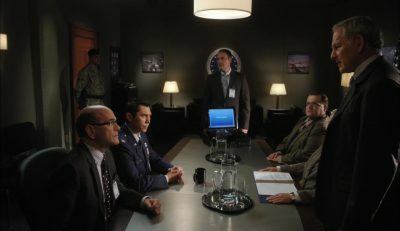 The use of the Destiny to house Amanda and Ginn pays off the more nebulous interactions between Rush and Franklin plus the image of his former wife and it was a delight to see the two actors back on the show after their “deaths”. Our thanks to Brad for the audio feedback for last weeks episode “Alliances” and once again our thanks to Ian for joining us for this episode of the podcast. This weeks promo is for Generations Geek the father/daughter show which looks at all things geek in the media. Next week we are going to be taking a look at the episode Seizure with our guest Brad and as always we’d love to hear from you in regards to anything Stargate. 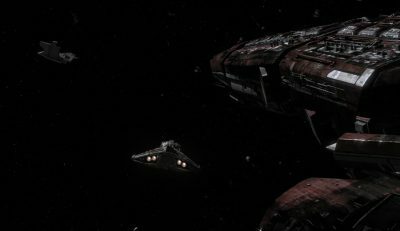 Stargate Universe ” Alliances ” concludes a story arc which has been in play since the assault on Destiny by the Lucian Alliance. As intelligence indicated an attack upon Earth various members of the invading force where kept on board and interrogated, this lead directly to the murder of Ginn/Amanda Perry and Simeon going on his rampage but also the addition of Varro to the crew. In this case a routine communication stone exchange to allow Dr Andrew Covel and Senator Michaels to board Destiny to gain more insight into the condition of the ship and crew went badly as Camille and Greer where in Homeworld Command when an attack by a cloaked cargo ship happened. The two of them survive but are trapped in the collapsed building along with another survivor but a geiger counter found in the rubble indicates a huge amount of radiation is present, Varro confirms that a Naquadria device is likely to be the means to destroy the city but something must have gone wrong. Alliances is a worthy conclusion to the Lucian Alliance plot, Varro once again proves himself invaluable despite the technical limitations of the communication stones and the interference of Covel which while being understandable wasn’t really thought through. It’s also interesting to note that Homeworld Command/IOA are having serious thoughts about the investment in time and resources required to recreate the Icarus base given the rarity of suitable planets. Great to see French Stewart returning to the franchise and no question the pairing of Camille and Greer was inspired with some great dialogue drawing upon their establish character conflicts present since the first episode. Ultimately the episode demonstrated the best and worst of humanity but when push came to shove and with little alternative what needed to be done was done. 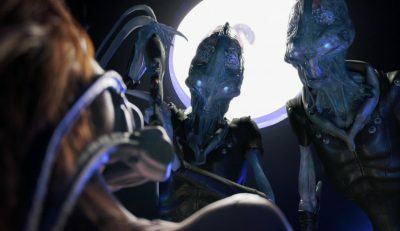 The episode wasn#t perfect though, I still have issues with the threat of the Lucian Alliance or at least how the writers chose to present that threat but the “terrorist” approach was small scale and kept most of the narrative tied to Destiny which is important for the show as you would expect. Our thanks to Miles for the audio feedback for last weeks show and to everyone that listened and/or spread the show info by social media. This weeks podcast promo is for Treks In Scifi hosted by Rico and next week we are going to be discussing the episode “Hope”, we hope you will join us for that. The episode title Twin Destinies hints at this story which begins with the Destiny is badly damaged from the recent conflict with the drones and the use of a star to power the 9th chevron dialing is once again addressed as Eli claims to have made a breakthrough with the work he did with Ginn. He uses the communication stones to exchange with Dr Lee and the attempt is given the green light. Rush is opposed to the attempt citing all the possible things that could go wrong with the chaotic variables they will be manipulating. Young allows Rush to present his thoughts to the crew and as we see there are enough people willing to stay onboard and continue the mission despite the state of the ship. As they fly towards a star they receive a signal from a shuttle approaching Destiny, onboard is Dr Nicholas Rush who reveals he has travelled backwards in time and his Destiny is dead in space and the crew gone. 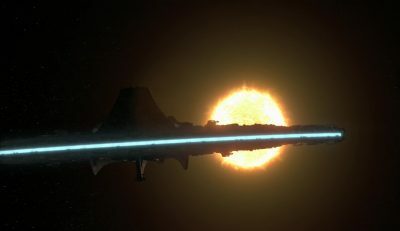 We learn that a solar flare intersected the wormhole and only one person made it back to Earth but there is a ship out there with spare parts, food, medicine and weapons and the opportunity has to be taken to bolster this timelines Destiny although one Rush may be one too many. Well it’s true you can never have too much Robert Carlyle and he went to town in the episode and also credit to Lou Diamond Phillips who as Telford was the only person to get home portrayed the survivors guilt and anger towards Rush with style. An unexpected conclusion to both characters but when you have a spare then you can always offer up a good death scene without taking away future potential story lines. 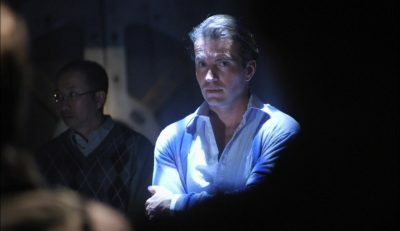 This episode also saw the final appearance of Bill Dow (Dr Lee) and the final sole writing credit for Brad Wright whose current series Travelers will return for a second season. Our continued thanks to Brad for making the time to record with us over skype from Australia and for sending in this weeks feedback for last weeks episode “Deliverance”. The promo played in the episode was for Nutty Bites a podcast hosted by Nuchtchas, always entertaining and often informative and surprising. Next week we are going to be joined by Ian for the episode “Alliances” and we hope you too can join us as we continue the journey along with Destiny. 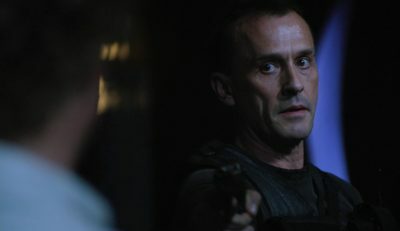 The second half of the second season of Stargate Universe kicks off with Deliverance which is the conclusion to the two part episode which began with Resurgence. The Destiny is under heavy attack from the mysterious Drones but Chloe has sent a message to the Nakai who have been searching for her since she was abducted and infected with some pathogen. Three of their ships jump in and a good portion of the drones break off from Destiny and attack the newcomers. Rush and Eli manage to jam the drone communications for a brief period of time which allows the Destiny to lock on with their main gun and destroy the command ship, the rest of the drones power down. They decide to bring one of the drones onboard to study so they send the shuttle out, it recovers a drone by the Nakai intervene and hold the shuttle hostage, they want Chloe and they are holding all the cards. Chloe is nearing the end of her time as a human and with little chance of recovery and the benefits of getting the drone she is sent over to the Nakai ship. She is taken on board and once again the aliens perform some sort of medical procedure on her while Scott patiently waits in the shuttle hoping she will be allowed to return. Eli and his band of merry scientists continue to study the captured drone and then another command ship jumps in and launches drones but the existing ones don’t react. Eli realises that each drone is tied to a particular command ship and having already accessed the code they manipulate the alien version of friend and foe and the older drones. The Ursini having learned their colony was destroyed give their lives in a suicide run on the command ship which gives Eli the time to finish his work and then the old drones begin to attack the new ones. This small respite allows the Destiny to risk a FTL jump with minimal shields but the ship is badly damaged and many of the crew are injured. Deliverance is an excellent episode and a good start to this group of episodes. The drones now take over as the primary antagonist for the ship as the Nakai and Chloe storyline winds down and as always as answers and provide many more questions are being asked. The visual effects of the space battles were stunning as you would expect and the practical effects onboard where visually dramatic. Chloe and Scott had a wonderful scene together and the comedic element was surprisingly strong with Eli and particularly Volker and Brody. I think we are in for a very entertaining ride as we head towards the series finale. We want to extend our thanks to Thomas for joined us to record two episodes in one evening, this was the second and he’ll be back for the season finale. Our thanks also go to Brad for the audio feedback and to the nearly three thousand twitter followers many of which regularly chat with us. This weeks promo is for The Babylon Project Podcast and next week we are going to be joined by Brad to talk about Twin Destinies. In the mid-season finale Resurgence the Destiny detects at extreme long range something that peaks Rush’s interest, given how focused he has been on the “mission” it’s surprising he is the one calling for the ship to alter course to investigate. When they arrive at this part of the galaxy they find a wreckage strewn area of space, sensors indicate at least 5 starships were destroyed, once is still fairly intact so a shuttle is sent over to board the ship, Greer and Brody get to don the space suits. 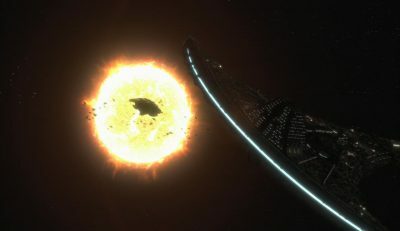 Suddenly a number of objects power up within the debris field and on board Destiny Eli thanks to a computer simulation realises that some of the debris is not as advertised and contain dormant power sources now activating. These small vessels zoom towards Destiny, the ship powers up shields and weapons and attempts to communicate, the response is sudden and violent as the ship comes under fire from these very fast moving drones. The ship looks doomed that an unexpected visitor arrives in the shape of a Seed Ship, together they jump away from the area and Colonel Telford gets to tell his story and how he has been spending his time alone with a bunch of aliens on the seed ship. Resurgence is quite an important episode as it introduces the main antagonist for the remainder of the second season, we also get the return of Telford and more information on the Ursini and the realities of this area of the galaxy. There are some spectacular CGI scenes in the episode with the Ursini ship, the wreckage field and the fast movers of this mysterious alien race who shoot first and never even worry about asking questions. As expected with a mid-season finale the cliffhanger is strong but unsurprisingly not that “edge of the seat” experience, Destiny is not going to get destroyed and no individual character was in particular dire straits. 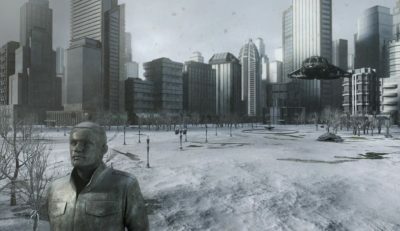 Overall a very strong and entertaining episode of Stargate Universe and we don’t have to wait a few months for the conclusion of this particular story. Our thanks to Thomas for joining us over skype from the states and he will return next week for Deliverance. Thank you to Mack for the feedback over on google plus and my appreciation for British Invaders podcast for continued entertainment for when I am working, their promo is featured this week. We hope you tune in next week to find out if the Destiny survives and the consequences of Chloe’s actions and of course we’d love to hear your thoughts on the episode or anything Stargate. Not so long ago a number of the civilian crew of the Destiny elected to stay behind on a world which appeared seemingly out of nowhere. They were led by Dr Robert Caine a charismatic man with a strong religious faith, he believed the world was placed in the path of Destiny as a home for the lost. In Visitation months later a shuttle appears (as if by magic) alongside Destiny which is now in another galaxy, on board the shuttle are the people that were left behind. The people led by Caine claim not to remember recent events, they went to sleep the night before then awoke to find themselves in the shuttle alongside Destiny. They are checked out and seem to be healthy but for obvious reasons there is a certain level of scepticism, they should not be here and if they are who they say there are how and why are they here? Eli approaches Val (Camille Sullivan) and after a brief friendly chat blood begins to pour from her nose and then scalp, she starts screaming and collapses dead on the floor. Her friend Peter (Tobias Slezak) struggles to recall events on the planet but under memory regression he recalls his relationship with Val and her death after she was struck by a falling tree which smashed her skull. Peter dies soon after of what looks like hypothermia, it seems the people from the planet are dying on board Destiny in the order they died on the planet. Caine is still sceptical but after Rachel (Michelle Harrison) passes he too undergoes memory regression and learns that they had no cabins or crops and they were slowly freezing to death inside the crippled shuttle. Caine was the last survivor and now the only one left alive on Destiny, he knows he is already dead but takes comfort in the fact that his soul has passed on and maybe the divine or an alien species reanimated the body to allow them to say goodbye. Caine passes soon after leaving only a Kino behind which appeared on the shuttle after it was searched, on the Kino are the last few moments of Caine’s life and a bright light that envelops the shuttle, the recording fades and a quiet contemplative silence encompasses the watchers. Visitation is a mind bending episode drawing upon the events from the episode Faith yet doesn’t really answer the important question as to what the planet represented or who/what created it. Mind you it did solve one important problem, the Destiny finally got a shuttle which she desperately needed. Yes there was always the Stargate but a space ship needs a shuttle type vehicle or there are limits to where stories can go. The episode of course being vague leaves the question of the divine wide open (as it should be), hard to prove a negative and there is a reasonable scientific explanation again unproven. It may be that at the last Caine used his faith to not only accept his fate but to finally give closure to TJ who is still broken over the loss of her child. We also got an excellent scene with Chloe and Greer, her fate may be sealed as the infection spreads but Greer asking for forgiveness as he accepts his hand will be doing the deed was very moving, wonderful dialogue and performances. As always we couldn’t do this without our guests, this week our thanks go to Ian and of course continued gratitude to Brad for the audio feedback for Malice and to Mack for the posts over on our Google+ page, appreciated. This weeks promo is for Flash Pulp the always entertaining source of original audio content, movie discussion and a little bit of music. Next week we are joined by Thomas to discuss the mid-season two finale “Resurgence” in which Destiny meets new “friends” and is reunited with old ones. We also had to go to the alternate prize draw winner, alas after three attempts the initial winner failed to get back to us so congratulations to Sarah, we’ll be contacting her shortly. Simeon always a dark presence amongst the Lucian Alliance detainees strikes with malice when he learns that his clansman Ginn has used the communication stones to visit Earth and briefs Homeworld on the impending attack on the planet. 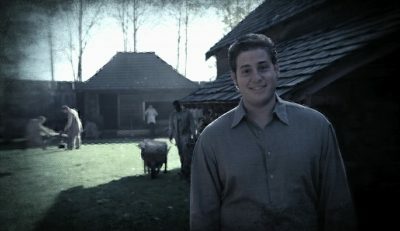 He kills Amanda and the connection between the two women seals Ginn’s fate which causes heart break for both Rush and Eli, Rush however is more assertive and doesn’t wait for permission to peruse Simone through the gate onto the planet which Volker dialed under the threat of Park being killed. A game of cat and mouse then begins as Simeon lays trap after trap to thin out the numbers of his pursuers, eventually Greet gets shot and Scott reevaluates but turns to find that Rush has once again gone off by himself, he finally corners the wounded Simeon and plays the desperate yet helpless victim luring the Lucian soldier into a very devious trap indeed. An explosion rocks the valley and a rumble is heard, Simeon turns and sees his fate rushing towards him. Malice is a wonderfully dark episode full of anger and vengeance with desperation and some of the most beautiful location shooting to ever grace Stargate it not and science fiction series made. The environment truly looks alien yet the western themes run strong and you could easily picture this being viewed in a theatre back in the day when westerns were all the rage in Hollywood. Robert Knepper signs off his stint on Universe with a fantastic performance and Robert Carlyle portrays the driven man to perfection. I have to say after the side step with our bonus episode return to Universe with Malice was perfect scheduling, an episode that kicks off this new year with drive and passion and more to come as we look to the second half of the final season of Universe. Our thanks to Stephen for making a long awaited return to the show but as you heard in the podcast the lad has been busy and thanks to Mack for the feedback. This weeks promo was for The Scifi Diner podcast and next week we are going to be taking a look at the episode Visitation, hope you join us for that. Our gratitude for your patience as well, still feeling some of the aftereffects of the website issues, the database and links are still damaged but working on it.